I was expecting the ’05-’06 Atlanta Thrashers to pose a little bit of a threat to the ’09-’10 San Jose Sharks, but definitely expected the Sharks to move on. Five of the six games in this series were one goal games and only one of those five games went to overtime. The Sharks actually trailed 2-1 in this series but took the final three games to advance. The Sharks were led by the usual suspects in this series. Dany Heatley, Patrick Marleau, Joe Pavelski and captain Joe Thornton lead the team in points, in that order. Heatley notched four goals and four assists for eight points. Marleau notched three goals and four assists for seven points. Pavelski tallied four goals and three assists for seven points and Big Joe posted three goals and two assists for five points. 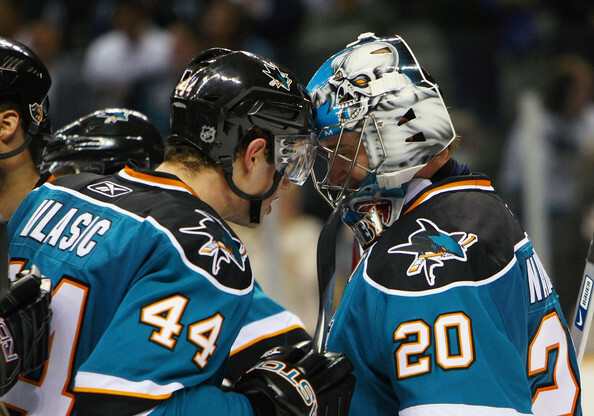 Goaltender Evgeni Nabokov was very solid in the series with a 2.67 GAA and a .928 SV%. Not too many people would remember that this Thrashers team had some supreme skill up front. Winger Marian Hossa led the team in scoring with three goals and five assists for eight points. He was followed closely by both Ilya Kovalchuk and Marc Savard who both posted six points, five goals and one assist for Ilya and one goal and five assists for Savard. In net, current Dallas Star netminder, Kari Lehtonen was a huge part of this series being as close as it was. The Sharks are known for their offensive firepower and Kari kept them under check for the most part. So the 28th-seeded ’09-’10 San Jose Sharks advance to the 2nd Round to face….uh oh….the 5th-seeded ’83-’84 Edmonton Oilers…..yep, those Oilers. Up next in the 1st Round is a matchup between the 21st-seeded ’99-’00 St. Louis Blues and the 44th-seeded ’74-’75 Kansas City Scouts. This entry was posted in 1st Round, Ultimate NHL Playoff and tagged 1st Round, Atlanta Thrashers, Dany Heatley, Evgeni Nabokov, Ilya Kovalchuk, Joe Pavelski, Joe Thornton, Kari Lehtonen, Marc Savard, Marian Hossa, Patrick Marleau, San Jose Sharks, Ultimate NHL Playoff. Bookmark the permalink.